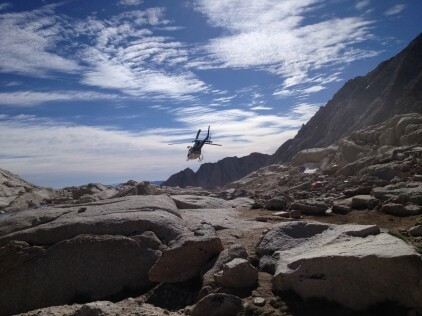 On the evening of Friday, June 20, 2014, Inyo County Search and Rescue was alerted that a 29-year-old male had suffered from a seizure at Trail Camp on the Whitney Trail. Four team members responded: two Wilderness EMTs and two Wilderness First Responders. A two-member hasty team made their way up the trail and interviewed hikers along the way to gather more information about the scenario. Among those interviewed were two members of the patient’s hiking party who provided critical medical information, including the subject’s history of exercise-induced seizures. The group had tried to walk him down the trail, but the patient had another seizure, vomited, and hit his head. None of the group was prepared to spend the night, so two members continued descending while the patient and one friend returned to Trail Camp to find shelter. The patient had two more seizures before we arrived. SAR members made contact with the subject at 24:00. Upon our arrival, the patient was in a tent lying supine on a sleeping pad under two emergency blankets. The team members spent the night vigilantly protecting the patient’s airway and keeping him safe when he was seizing. He had a total of 7 seizures throughout the night. At first light, a CHP helicopter out of Apple Valley headed toward Lone Pine to assist in the evacuation of our patient. The helicopter arrived at our location at about 0800, and by 0830 the patient was loaded onto the helicopter with a paramedic en route to Southern Inyo Hospital. This was not the only mission of the night, however. Near Trailside Meadows, the SAR hasty team encountered a group of hikers assisting a female who was suffering from Acute Mountain Sickness. Given the severity of the situation further up the mountain, SAR members encouraged the group to continue descending and assisting their friend. Information on a possible second rescue was relayed via radio to the two other SAR members. When the group made contact with the second SAR team, it was decided that one of the SAR members would turn around and assist the patient down the trail to safety while the other team member continued up to Trail Camp with supplemental oxygen for the seizing patient. The female AMS patient was disoriented and unable to answer questions about recent events. Her physical mobility deteriorated below Outpost Camp, at which point she needed to stop and rest every 2-4 minutes. The SAR member accompanying her party fitted her with a tubular seat harness which allowed her helpers to assist her over the steps and provide greater support in the narrow sections of the trail. Further down the trail, rest stop frequency improved to every 10 minutes. Once the group descended below 8,900 feet the patient’s condition improved dramatically. They reached the trailhead at 0400, by which point most of her AMS symptoms had disappeared. Both of these groups did the right thing by staying with their afflicted/ailing friends. This made it easy for us to locate the patients and ensured their safety. The other hikers who lent their tent, sleeping bags, pads, and emergency blankets to the seizing patient at Trail Camp created a safe environment for the patient and his friend, who were otherwise unprepared to spend the night at 12,000 feet. This generosity greatly contributed to the health and safety of the subject and his friend. Another big thanks goes to all of the folks at Trail Camp who helped with the patient’s evacuation the next morning. Posted in 2014, Missions Reports.